Robert Armstrong's THE BIRTH OF EASTBOURNE is a time machine transporting the listener back to the town's creation as seen through the eyes of a travelling family just arrived to witness this event. Emerging out of the countryside, it is an area touched by Romans, Saxons and Medieval history. Then, in 1883, the town took on its important role as one of Britain's leading seaside resorts. In the BIRTH OF EASTBOURNE, the listener relives the moment when the population of four hamlets swelled to 22,000, making Eastbourne a fully fledged town. But it is not just a political history, for Eastbourne is made of many facets - the great mansions in the Meads, more modest dwellings at the eastern end of the town, of fishermen, promenade artists and the people who were to serve the influx of visitors. THE BIRTH OF EASTBOURNE is a living account of these momentous years, from 1883 to the start of the 20th century; years that have put Eastbourne not only nationally, but internationally on the map. Every year in Lewes, an effigy of the Pope is carried through the streets and burnt on a huge bonfire. It is a reminder of a dark period of English history when bloody Queen Mary was on the throne and over 300 protestants were sent to their death. It is the true story of one of those martyrs, Richard Woodman, an iron master from the village of Warbleton who along with ten others, were executed on June 22nd 1557, by being burnt on the stake. His exact words, recorded in Fox's Book of Martyrs, have been carefully woven by the author, Robert Armstrong, into a moving story which makes this paper back book/audio book a memorable experience. For many years the scars of canon balls pitted the cliff face of Beach Head. This is the story of a little known battle which took place off Beachy Head on June 30th 1690, seen through the eyes of an old man who survived to tell this story. If you would like to take an in-depth tour of Eastbourne, then there is no better way than to watch Eastbourne Now - it reveals the true Eastbourne, going behind the scenery to see some of the activities that keep the town in the forefront of resorts. Glimpse the town's past - and history in the making. This 50 minute DVD has an atmosphere that is truly Eastbourne. 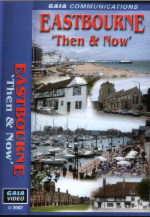 Residents and visitors alike may be fascinated by this nostalgic view of Eastbourne - an excursion using old photographs and current footage covering over a hundred years of history. Did you know that Eastbourne may be built on the foundations of a Roman city? That in the early part of the 20th century it was a mecca for aviation? That it was created by the vision of one man, the 7th Duke of Devonshire in 1850. This and much more can been enjoyed by watching Eastbourne 'Then & Now' - 50 minutes on DVD. 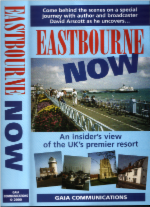 Since Discovering Eastbourne was produced in 1993, there have been many changes to the town. This documentary has become a historic document recording such things as the launch of the lifeboat from the shingle beach, the once popular marathon race and similar events. 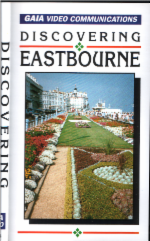 It was on outset an in-depth look at Eastbourne's history, with information on the towns birth and growth since its conception in 1850s. It remains an important film to watch for all those who want to learn about the town. This DVD has a running time of 56 minutes. Robert Armstrong Television Services, 20 Pevensey Road, Eastbourne.